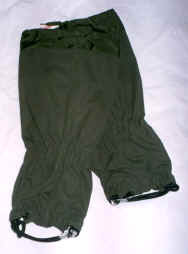 Gaiters. Once the one piece of outdoor kit most likely to spawn a love-hate relationship with its user. They'd protect your lower legs from damp grass, scratchy heather and deep snow. They'd do the job admirably, but then destroy a wonderful friendship by offering up an endless stream of frustration - zips jammed with bits of heather and dried mud, or adjustments that are too fiddly to even contemplate with cold fingers, or thick mitts on. That was the bad old days. Thankfully things have moved on. While the basic concept remains the same, designs have changed to make these leg protectors far more user friendly. The majority now have the main closure at the front, chunkier zips have been introduced and, in some cases, the zip has been dispensed with altogether, in favour of tough Velcro strips. Indeed, the first thing we noticed when the test gaiters began wandering into the walkscotland.com office, was the proliferation of Velcro in the various designs, all to the good, we have to say. Gaiters come in various different shapes and sizes so you should always don your boots before setting off to the outdoor shop to get a fit compatible with your chosen footwear. Make sure your choice is snug around the leg, fastens up tightly below the knee to prevent it slipping down the leg and hugs the edge of the boot so that mud or snow can't get up and under. The other important thing to ensure in the shop is that they are easy to put on and take off. This is a key area we've looked at in our tests as you don't want to be fiddling about with difficult to grasp zips and cords in the wilds. Finally, take good care of your gaiters. Make sure you wash them off and dry them out at the end of the day, or mud, grime and vegetation will jam zips and have you cursing. Materials: waterproof and breathable textured nylon. 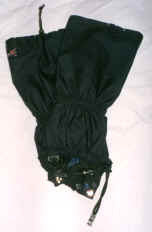 Closure: front zip with Velcro flap. Top fastening: drawcord and toggle. Instep fastening: thick shock cord with metal hook fastening. We really liked the Ranger - it's lightweight and very easy to use. There's a chunky front zip with Velcro flap, but our favourite feature is the instep fastening - a metal hook on the end of a length of tough shock cord which pulls under the foot and links into a plastic ring on the otherside. Simplicity itself. The textured nylon has a good flexible feel to it and the fit is comfortable. It also proved to be waterproof, breathable and hardwearing. Very highly recommended. Materials: 12oz cotton duck canvas. Sizes: two, regular and long. The Snolock brought back wonderful memories of my very first pair of gaiters, thanks to its traditional canvas construction. While the majority of gaiters these days seem to be made of more modern fabrics, its good to see that a long tried and tested material is still available. Cotton canvas offers good comfort, is very breathable and also extremely hardwearing. The Snolock should last you for years, provided you take good care of them and reproof them every so often. The Snolock is the only model in our test with a rear zip, which requires some manual dexterity. As with the Trailwise Range, we like the underfoot shock cords, fastened using a metal hook and plastic ring. The top fastening lace is easy to use, although not as convenient as having a toggle. Great value at £20 and should last for years. Materials: coated ripstop polyester uppers, coated Kodra nylon base. Closure: size zip, Velcro and stud-closed flap. Top fastening: elasticated strap with Velcro. Instep fastening: Velcro strap, sewn-in. Sizes: one for men, one for women. A low cost gaiter, the Wynnster Delux has some nice features that help simplify use, particularly the underfoot strap which loops up to attach itself to the Velcro used to close the flap over the zip. This proves to be very firm and makes the Delux very easy to put on and take off. Velcro seems to be the order of the day, in fact, as the top fastening also adjusts using this wonderfully versatile material. The fabric isn't breathable, but then you're paying less than twenty quid for a very easy to use design. Top fastening: toggle and nylon. Instep fastening: drawcord, elasticated ankle. The Regatta Super is one of the lowest priced model on our test and, as such, doesn't benefit from the breathability of more expensive models, although it did prove to be waterproof and hardwearing. We had our doubts about the top fastening and instep cord fastenings initially but they did the job, although are a little fiddly, and stayed in place on our test hikes. I fear the instep nylon lace may not stand up to long term use but replacement would be easy enough. The design fits well and the front zip makes for easy access. Materials: waterproof/breathable coated polyester upper, coated Cordura base. Top fastening: elasticated drawcord and toggle. Instep fastening: neoprene strap with slider buckles and webbing loops. The Mountain Range stood up well to an extremely wet testing on a trek up Ben Vorlich. They were quick and easy to put on and pretty simple to adjust. A chunkier zip is the only improvement we would suggest. They're one of the cheaper models in our test, pricewise, but are one of the best value, offering a breathable fabric which some of the other cheaper models don't. One of the best front zip models available. Recommended. Top fastening: elasticated cord and toggle. Instep fastening: wide rubber band. 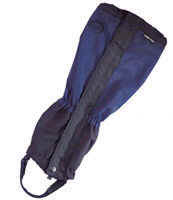 A basic and very inexpensive gaiter suitable for three season walking. The Fell's nylon material isn't breathable, but it fits well with a good snug fit round the boot and leg. Fitting is easy enough, although the rear zip isn't quite as convenient as a front one. The toggle on the top fastening is a good size, though, and the underfoot band is tough and easy to adjust. If you're looking for a good, cheap, lightweight model, and are prepared to put up with a rear zip, then this is the one we'd go for. Materials: waterproof and breathable, coated nylon. Closure: front zip with Velcro flap, studs top and bottom. Instep fastening: neoprene strap with slider buckles. The North Cape Mountain is a very good value and functional product. The chunky front zip is easy to use, even with gloves on and the drawcord at the top has a nice big toggle, making it easy to adjust too. The strap under the foot is tightened through plastic buckles and has a webbing sheath to protect it from damage, a useful touch, which should make it last longer. The nylon is tough, breathability is good and they're comfortable and flexible. Features combined with price make this our best buy. 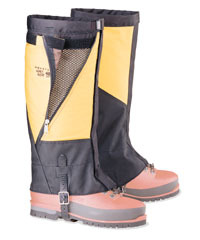 Materials: Gore-Tex three-layer Taslan upper, nylon double polyurethane coated lower section. Top fastening: toggle and shock cord adjustment. Instep fastening: Polypropylene underfoot strap with Velcro fastening. The Brasher GTX is an excellent lightweight, breathable gaiter that is just so easy to use. There's no front zip to worry about jamming. The Velcro front fastening can be closed or pulled of with no fiddling, ideal if you're wearing thick gloves or have cold fingers. This is great when you arrive back at the car after a long day, and can just rip off muddy, wet gaiters in a couple of seconds and bung them in the boot. The Velcro instep fastening is a great idea, for exactly the same reason. These are no-fuss gaiters, that are comfortable and flexible, durable and do the job wonderfully. They come with illustrated instructions for use on the label and replacement underboot straps are available from Brasher outlets. Very highly recommended. Materials: Three layer Gore-Tex Taslan upper and Ardera 500 fabric over boot area. Closure: front zip closure, Velcro flap. Top fastening: toggle-secured cord at top. The Yeti Attak was developed by Berghaus to give the foot maximum protection in wet and cold conditions. They differ from normal gaiters in that they completely enclose the boot, except for the sole. This makes for a very snug fit round the sole, preventing just about anything getting in. They're ideal for walking in snow and wet conditions, and great for river crossings. The Gore-Tex upper is waterproof, breathable and very durable, while the rubber base is fine and flexible, with good elasticity. A forefoot strap keeps the gaiter securely in place. The front zip feels tough enough for the job and there's a good sized grabber on it. Materials: FTX Ultra, a waterproof and breathable fabric. Top fastening: web band with plastic buckle clip. Instep fastening: Plastic belt strap with buckle. The FTX Ventigaiter is a tough gaiter suitable for the hardest conditions. It's aimed squarely at serious winter mountaineers and cross-country skiers, featuring a Duraguard reinforced zone, which prevents damage from crampons and ski edges. 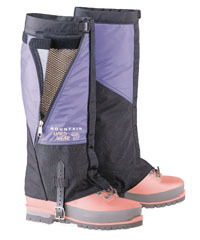 The wide fit is designed for use with plastic mountaineering or ski boots and overall, the design overall is rugged. The front closure is a Velcro strip, making the Ventigaiter easy to put on or take off while wearing thick gloves. The front hook loops under, rather than over, boot laces, which means there is no danger of them coming away, even when you're trudging through deep snow. There's a tough belt-type strap under the foot with a metal buckle, which was easy to adjust to the right fit. The FTX and Altitude are the only models in our test with ventilation flaps. If you're starting to overheat, you simply unzip the flap, roll it back and attach it to a Velcro strip. A mesh panel stops bits of heather of grit coming in. A nice touch. The top fastening is a web band, rather than a cord, and there's a rather fiddly little plastic clip, requiring finger nails to open which is the only feature we weren't particularly keen on. Materials: three-ply Conduit nylon ripstop laminate upper and seamless Cordura lined lower section. Top fastening: webbing belt with plastic buckle clip. 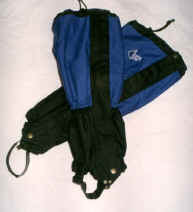 Instep fastening: plastic strap with buckle. The Altitude, a lighter version of the FTX, has a looser, less leg-hugging fit than the other models on test which makes it ideal for wearing over bulkier plastic mountaineering boots but are equally at home over normal walking boots and would accommodate crampons well. They performed extremely well in tough conditions and, while aimed at alpine adventurers and cross-country ski tourers, would be perfectly at home on a winter expedition in Scotland, offering all the protection you could want. 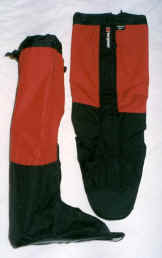 The features are the same as the Ventigaiter, and they also have the ventilation flaps.